Chromium (Cr), transition element (transition metal), is a odorless, tasteless, and malleable heavy metal element with an atomic weight of 52. In chemistry, Chromium Compounds are any inorganic compounds that contain chromium (Cr) as an integral part of the molecule. 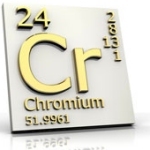 Chromium (Cr) is an essential mineral (Trace Metal) that is required in the maintenance of our health. Chromium (Cr), transition element (transition metal), is a odorless, tasteless, and malleable metal element with an atomic weight of 52.